Sydney cast a long shadow when I was growing up in Melbourne. The magnetic metropolis to the north exerted a powerful mythology, one freighted with hyperbole. Sydney just represented more. More people, more tall buildings, more hubris, more crime, more beauty. More of life’s essence, somehow. Here was a city where people surfed before work and sipped cocktails at the top of revolving buildings. The skyline was always changing, a mosaic of heritage sandstone landmarks crammed next to glistening skyscrapers from homegrown architectural heroes such as Harry Seidler, who learned his craft at the side of mentors like Alvar Aalto, Marcel Breuer, and Oscar Niemeyer before returning to put his mark on the city. His stark modernist towers, Australia Square and MLC Centre, still dominate the skyline. Bold design has been a hallmark of Sydney since Danish architect Jørn Utzon won the contract to design the Sydney Opera House. It was just the brand of proper society-scandalizing, tradition-flaunting modernism that Australia needed to put it on the map. Even now those famous white sails have the same hold on the global imagination as the Eiffel Tower or the Chrysler Building, monuments to ambition and chutzpah. Today, Uzton’s grandson Mika carries on his grandfather’s legacy with artistic and design projects both at home and overseas—his latest is the New York flagship store for cult Australian leather outfitter R.M. Williams. On a more subtle level, architects like Pritzker Prize-winning Glenn Murcutt helped create a distinctly Australian architectural vernacular, using materials like corrugated iron, steel, glass, and local timber that fit in with his ethos: “Touch the earth lightly.” His designs, many of which can be seen around New South Wales, have an organic, fluid resilience. If Sydney’s rough edges have been polished over in recent decades, transforming it into a glossy international Everycity, there’s also still plenty of that larrikin spirit lurking just below the surface. It’s present in the fashion scene, which long ago rejected paying homage to European and American catwalks in favor of embracing a distinctly antipodean brand of unbuttoned, streamlined cool. It’s embedded in the robust dining scene as well: Chefs here graze freely at a buffet of international influences, sampling a touch of pan-Asian fieriness, borrowing the smoky carnivorousness of Latin American grill culture, absorbing classical French technique and then totally transforming it. There’s a salty, punk-rock swagger to the city’s creative class that makes a visit invigorating, like diving under a wave at Bondi Beach and then emerging, dazed but renewed. Sydney’s art scene is a perpetual work-in-progress, a balancing act between honoring the essential contributions of the country’s original custodians, the Aboriginal people, and making room for envelope-pushing contemporary artists whose gaze is increasingly global. 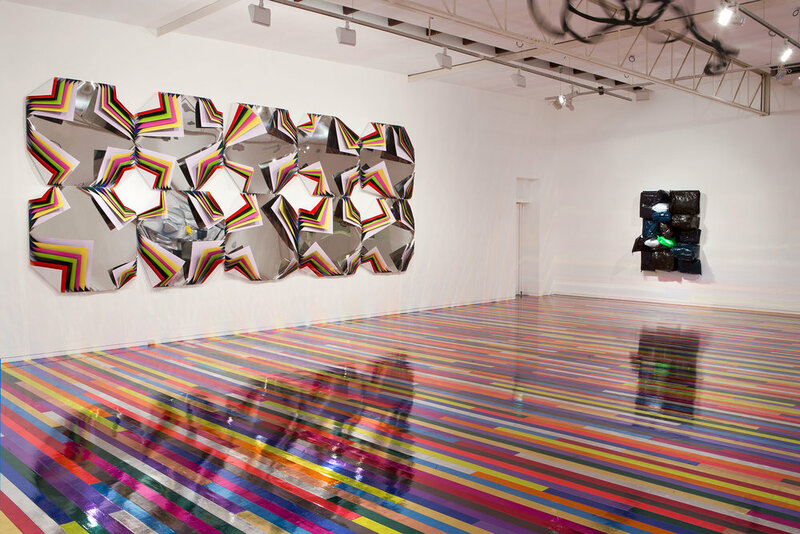 While there’s a healthy share of classic white cube galleries, many local high-profile players take advantage of the city’s greatest asset: sheer physical beauty. Circular Quay is home not only to the Opera House, but one of the most important institutions, the Museum of Contemporary Art, which holds a dress circle location overlooking Sydney Harbor. A brand-new urban renewal project, Barangaroo—designed by Australian landscape architects Johnson Pilton Walker in association with California-based Peter Walker & Partners—won the 2016 Parks and Open Space Landscape Architecture Award for its thoughtful layout. It lures weekend throngs with its stellar location on a formerly industrial, unused slice of the harbor foreshore that has been transformed into a vast green space. It hosts outdoor art projects and public art installations, the first of which is a work called “Shell Wall 2015,” by local Aboriginal artists Esme Timbery and Jonathan Jones. If there’s a sense among some of the cognoscenti that the cultural offerings have slipped into a holding pattern since the heady heights of the 2000 Olympics, there are also plans afoot for a reinvigoration. Exhibit A: Sydney Theatre Company co-artistic directors Cate Blanchett and Andrew Upton’s ambitious vision to make Walsh Bay, the waterfront home to the STC, the world’s first green arts precinct and the hub of a “cultural ribbon” that will stretch from the Opera House to Barangaroo. At the same time, trailblazers like founder Judith Neilson are raising the profile of emerging art worlds; China, for instance, is the key focus of her highly respected White Rabbit Gallery. The four-story space, a former Rolls Royce service depot from the 1940s converted by Smart Design Studio and set in the burgeoning Chippendale neighborhood, showcases one of the world’s most significant collections of Chinese contemporary art: around 2,500 works. Positioned at the site of an erstwhile rail yards and blacksmith in Waterloo, Carriageworks is an ambitious multi-arts center whose roster includes leading Australian and international talent such as Nick Cave and Francesco Clemente. Its neighbor, 2 Danks Street, founded by arts patron Leo Christie, occupies a repurposed Kodak factory and is now home to eight galleries. 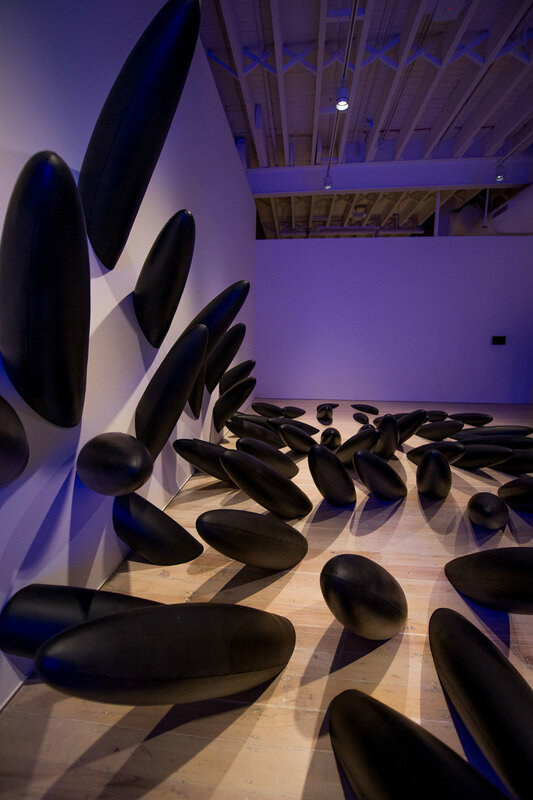 The standouts are the acclaimed Utopia Art Sydney, whose main purview is monumental Aboriginal paintings, and Brenda May Gallery, which represents artists like Tanmaya Bingham, known for her multimedia works featuring luminescent bodies and strange creatures. Fans of Brett Whiteley, the late enfant terrible of 20th-century Australian art, will thrill to the in-situ authenticity of the Brett Whiteley Studio, the painter’s former workshop and home. The revamped warehouse holds unfinished paintings and collections of reference books, along with a graffiti wall covered in quotes and images. For a primer on the country’s contemporary giants, don’t miss a visit to Roslyn Oxley9, a magnet for deep-pocketed collectors since 1982. Oxley—who together with her husband Tony was awarded the Medal of the Order of Australia for her services to the visual arts—has fostered the careers of a cadre of influential locals, including Tracey Moffatt, David Noonan, and Fiona Hall. Sydney’s culinary community is hitting its stride right now. The city’s glossy (and pricey) gastro-temples—Quay, Rockpool, Tetsuya’s—are still going strong, but there’s an emerging counter-movement celebrating a more relaxed, freeform approach to cooking. Case in point: Automata, chef Clayton Wells’s first solo venture following stints at Momofuku Seiobo and Quay. The year-old kitchen became an instant hit for gastronomic gambits such as seaweed-wrapped hapuku fillet in a black sauce of cured roe and sea succulents that has been jokingly called Sydney’s least Instagrammable dish. The warehouse-style space, designed by Matt Darwon (a.k.a. Matt Machine), is like stepping into a steampunk-meets-Scandinavian fever dream, riffing on the industrial history of the Chippendale neighborhood with machine-inspired lights and salvaged wood panels. Maurice Terzini, whose Icebergs Dining Room & Bar overlooking Bondi Beach continues to be one of Sydney’s hottest tickets, is behind the newly minted Dolphin Hotel, a gastropub in the inner-urban suburb of Surry Hills. The heritage building was reimagined by designer George Livissianis, who created a warm, convivial environment with Keith Haring-esque textured fabric walls and illustrations by artist-in-residence Beni Single. At Lot 1, diners tuck into salumi and hand-made pasta beneath the beams of the magnificent sandstone John Solomon building in the Central Business District. The interior showpiece is a curvaceous timber sculpture inspired by the swirling crema on an espresso. 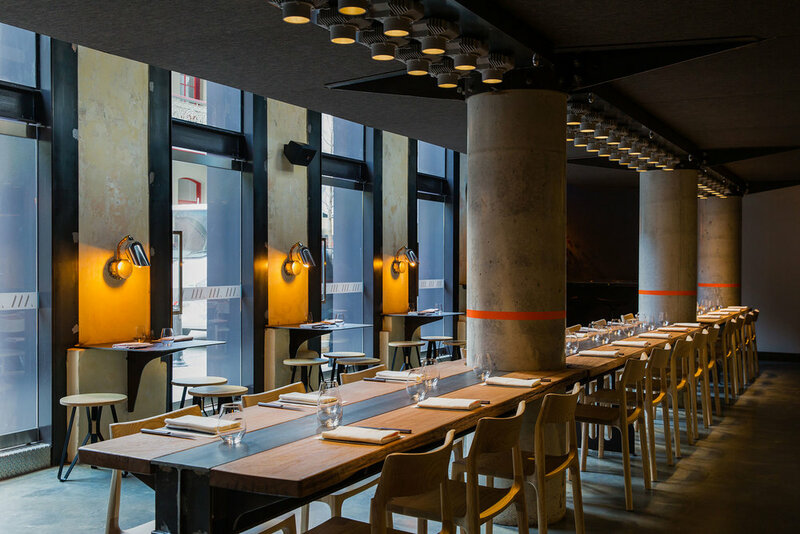 Close by is the Bridge Room, where architect Nick Tobias created a gorgeous visual backdrop for Euro-Asian dishes prepared over binchotan charcoal and slow-smoked in the Japanese Robata style. Patrons sit at low-slung tables on Deer chairs, designed by Autobahn, near a whimsical “felt origami” wall. Few chefs have elevated Chinese cuisine in Australia to the heights that Kylie Kwong has: Her legendary dining room Billy Kwong recently relocated from Surry Hills to a George Livissianis-designed space in Potts Point. Artworks range from a Tibetan yak skull to paintings by Martin Sharp, but most people lucky enough to snag a reservation will be concentrating on the plate, where dishes like wallaby tail braised with black bean and chili show off the toque’s mastery of culinary fusion. For those seeking high drama, the newly-revamped Bennelong fits the bill. Set in a cathedral-like room inside the Sydney Opera House and helmed by acclaimed chef Peter Gilmore, polymer-and-brass tables designed by architect Tim Greer and light fixtures by British designer Tom Dixon set the stage for a three-course set menu spotlighting the country’s best produce. A more low-key waterfront experience awaits at LuMi Bar & Dining, a compact glass box on a Pyrmont Bay wharf where chef Federico Zanellato is flooring locals with his innovative Italian-Japanese mashups. The eight-course tasting menu trips a fantastical trail from sorrel-and-lime sand crab through mushroom agnolotti served in dashi broth, and ending with pineapple tacos. In harborside Woolloomooloo, architects Luchetti Krelle have transformed the Tilbury Hotel from a classic Aussie pub into an airy ode to Danish modernism. The pastel color scheme is accented by natural woods and hand-quilted chairs, and opens to a back patio covered in olive trees and frangipani. After years of in-the-works projects, anticipation has given way to excitement with a host of debuts that reveal the broad range of design emerging across the city. Spearheading the change is the Old Clare, set in an 1830s brewery and 1930s pub. The 62 rooms feature eye-catching pieces by names like PSLAB, who manufactured light fixtures using upcycled car lamps; earth-inspired cushions and tote bags printed with droll phrases by Sydney designer Eloise Rapp; furniture fashioned from vintage machinery and engine parts by London-based group The Rag and Bone Man; and artworks by Richard Glover and Jason Loucas. The Hassell-designed Ovolo Woolloomooloo in Finger Wharf has several previous lives—as a W and Blue Hotel—but this iteration seems destined to stick. 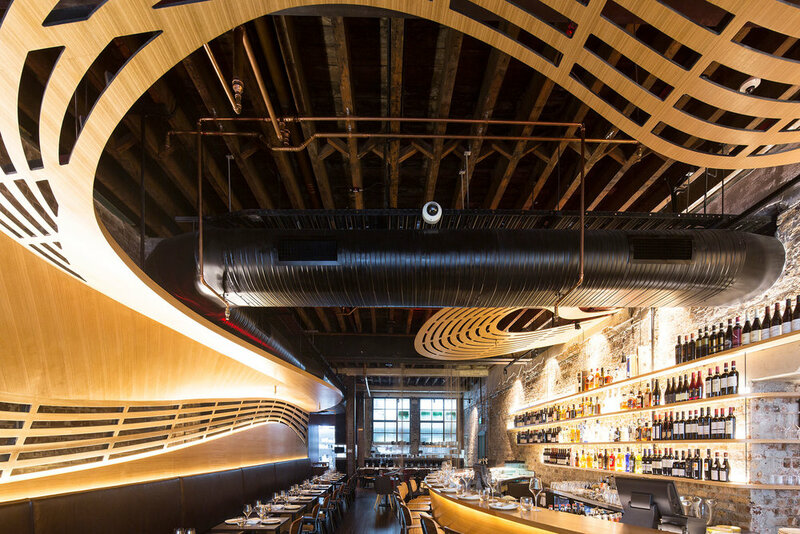 The former warehouse’s immense atrium spine is broken up using pavilions that function as a check-in desk, bar, and series of lounges with Thonet sofas and retro video-game tables. The 100 water-facing rooms are pared-back and kitted out with graphic bedheads and rough-hewn iron joists. Sydney’s beachside suburbs have always lacked in the accommodations department, but the new upbeat, artsy QT Sydney Bondi, courtesy of hometown designer Nic Graham, changes that. Expect locally-inspired motifs in the 69 rooms, from the digital artworks by Australian artists Shaun Gladwell and Dean Tirkot to the Bondi-brewed Wild Kombucha in the minibars. In the heart of the CBD, a 1930s art deco landmark has a new lease on life as the Primus Hotel, a 172-room retrofit by architecture firm Woods Bagot with a cavernous lobby featuring red columns made from scagliola—an Italian plaster resembling marble—and a paneled skylight crowning the lobby. Another highlight: the rooftop terrace, once a wartime rifle range, has a marble bar and raised plunge pool. 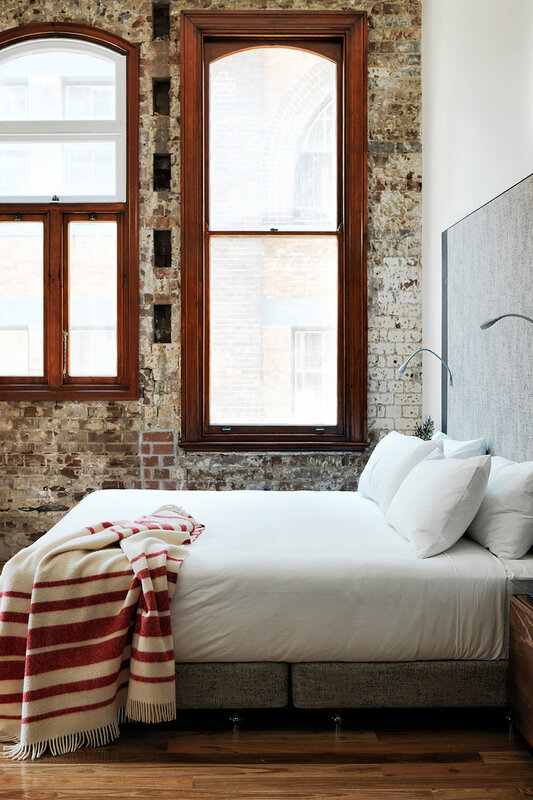 Tucked into a brick-lined laneway near Circular Quay, the 31-room Establishment Hotel is a study in juxtapositions: plush velvet sofas against raw brick walls; 19th-century columns and Japanese-inspired black stained wood floors. Its best amenity might be its close proximity to Merivale Group’s entertainment complex, home to perpetual hotspots like Est, Hemmesphere Lounge, dim sum joint Mr. Wong, and the Palmer & Co. speakeasy. A snapshot of Sydney’s street style might perpetuate the idea of Australians as laid-back dressers who pair flip-flops with everything, but a closer look reveals a fashion industry starting to garner international recognition. To get an overview, head to Intersection, a retail strip in the leafy, upscale Paddington neighborhood that stocks homegrown designers like Bassike and Zimmermann. Nearby, next-gen tailor P. Johnson is the place to get a lightweight bespoke suit. The atelier offers three cuts, all of which employ a “floating canvas construction.” The result is an elegant line with greater flexibility. The refurbished gallery was designed by Johnson’s wife, Tamsin Johnson, an interior designer whose eclectic sensibility shines through in elements like a bookcase made of wood salvaged from an old Milanese pharmacy and a 1970s Fornasetti table. Known for their covetable knitwear, designers Jacqueline Hunt and Lisa Dempsey of Jac + Jack have returned from a successful overseas push to open a boutique in Bondi designed with longtime collaborator George Livissianis. The monochromatic interior, with its subtle use of concrete and exposed pipes, reflects the spare, androgynous simplicity of the duo’s line. Established in 2011 by peripatetic husband-and-wife team Nicola and Orlando Reindorf, the Standard Store is a Surry Hills emporium peddling offbeat fashion brands discovered on trips to Europe and the U.S. Shop for bamboo-handled umbrellas from London Undercover and tees from French brand Maison Kitsuné. Since 2001, eagle-eyed buyer Eva Galambos has taken Parlour X from an under-the-radar boutique to an incubator for some of the globe’s biggest fashion talent. Moving recently from its original location in Five Ways, Paddington, to a heritage-listed church on Oxford Street, the new home was renovated by Tobias Partners. The firm honored the building’s bones—sandstone walls, beamed ceilings, stained glass windows—while creating a streamlined retail experience with coveted brands like Maticevski and Chloè.